BeachMint — an ecommerce startup that lets customers subscribe to receive products hand-picked by celebrities each month — has quickly become one of the hottest companies in Los Angeles. Today the company is announcing that it’s raised a $35 million funding round with some big-name investors: the round is being led by Accel Partners, with participation from Goldman Sachs, New World Ventures, NYC-based and Millennium Technology Value Partners, with existing investors participating as well. Accel’s Greg Waldorf will be joining BeachMint’s board. This brings BeachMint’s total funding to a whopping $75 million. This is obviously a big raise, and it comes only seven months after the company raised $23.5 million at a rumored $150 million valuation. Why are they raising so much? The short answer: they’re growing like crazy and are planning to go international — and they’ll be fending off plenty of competition. BeachMint, which was founded by MySpace cofounder Josh Berman and Diego Berdakin, has made an art out of launching celebrity-endorsed monthly subscription sites for a variety of verticals, using a model very similar to ShoeDazzle, which launched in 2009. BeachMint launched its first vertical, JewelMint, in October 2010, pairing actress Kate Bosworth with her stylist Cher Coulter. Each month the duo select or create pieces of jewelry that get delivered to subscribers, who pay $30 a month for pieces that the company says would normally retail for a multiple of that price. 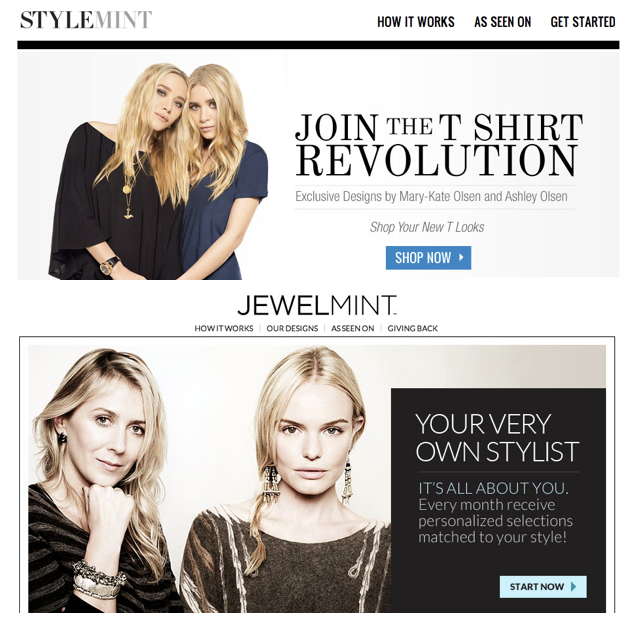 JewelMint proved a success, and the company launched its second vertical, StyleMint, in July 2011 — this time backed by Mary-Kate Olsen and Ashley Olsen, who design exclusive T-shirts for the site. Since then, it’s been a stream of rapid-fire launches: BeautyMint launched in November 2011 with Jessica Simpson on board, and ShoeMint launched a few weeks later with Rachel Bilson, Nicole Chavez, and Steve Madden attached. And two more ‘Mints’ will be launching in the next two months. Those launches have contributed to some major growth for the company: Berman and Berdakin say that the subscriber base and revenues have more than tripled in the seven months since the company’s last funding round. And the company’s headcount has growth to 120 — a third of whom are focused on tech and product, a third on customer support, and a third marketing and content. As for competition, Berdakin says that there are indeed competitors in each individual vertical, but says that none of them have grown to target multiple verticals simultaneously, the way BeachMint has. He adds that another differentiating factor is that the celebrities aren’t simply involved in name only — they’re actively participating in the product creation and selection. In addition to launching more verticals and expanding internationally, Berman says that BeachMint will also be holding more online events similar to the Cyber Monday stream it held on Facebook last November. He says the event was very successful, and that ultimately the company hopes to use these sorts of streams to create a new at-home shopping experience — one that takes the QVC experience on television, and brings it to the web.